Few spring vegetables on the stalls yet. Asparagus and spring onions, yes–but where are the broad beans? The rain continues to pour and it’s still cold–making it near impossible for local vegetable growers. I buy a couple of fat courgettes (Spanish, no doubt) and think to grill them in thick slices on the griddle and top them with scallions/spring onions done the same way. … and go well with the salmon fillets I just bought. Heat the griddle to hot. Mix the the courgettes slices with a tablespoon of olive oil. Mix the onions and chili with a little less olive oil. 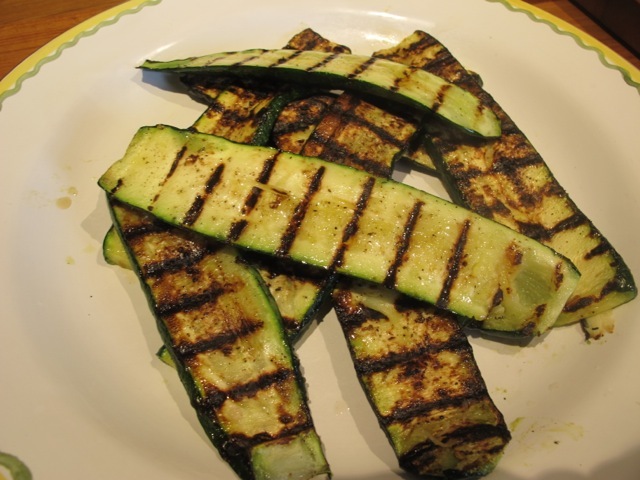 Place the courgettes slices on the griddle and leave for five minutes to char and soften. Turn over and repeat the process. When you judge they are done sufficiently remove to a serving plate and grind over some pepper. 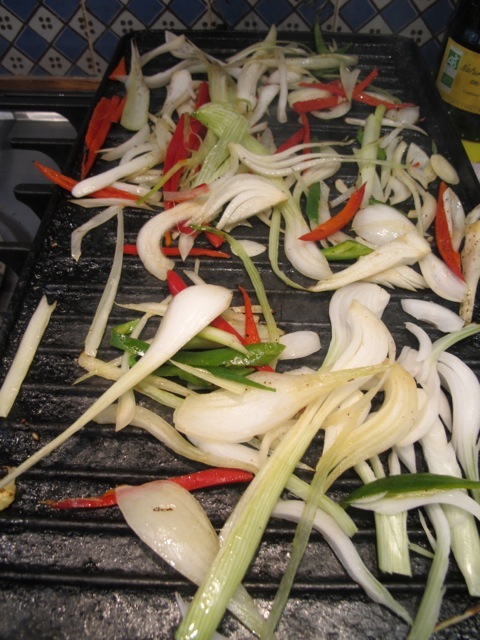 Distribute the onion and chili mix over the griddle. Grill for about five minutes to soften and char these too. Remove them to the serving plate, season and serve. This lunchtime they made a nice contrast with the salmon fillet cooked slow (see recipe in Delicious Dishes for Diabetics!). Reminds me of a song……..It might as well rain until September. Not in Holland, sunny and warm! I love your recipes!! I’m happy for Holland, Nel!! I wouldn’t normally refer to a vegetable dish as luscious-looking… but that looks absolutely luscious! Little Autumn’s lost his way and has wandered into May. Continuous rain and flooding across southern Germany. Alternatives? A plane ticket or you have to stay longer in the office. Unfortunately, this applies to me. It can only get better, but when? Robin, you may be interested to know that we are having our wettest year since the early 1900s. So far, in 5 months over 1000mm and Autumn has just finished!!! Feel sorry for all our farmers and primary producers. After just finishing watching POLDARK – Again!!! , I have now morphed into a follower of your cooking emails on line. 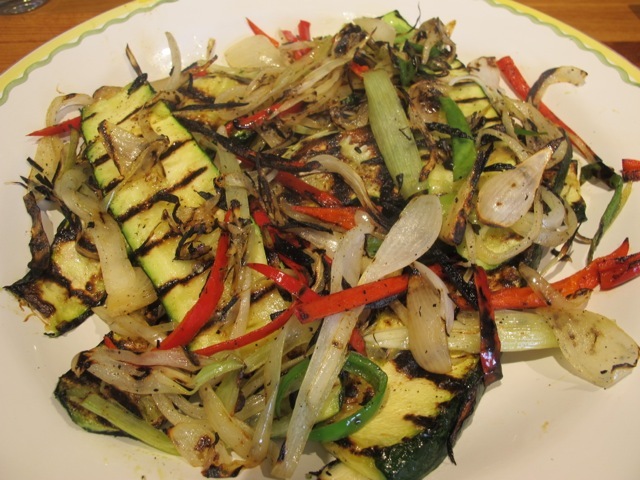 Can’t wait to try the grilled courgettes next. Also, as a retired French and German teacher in public school, I am happy to learn that zucchini is called courgettes in French. I guess I never discussed cooking zucchini in my junior high school language classes!!! Never too old to add a bit to my foreign language vocabulary! 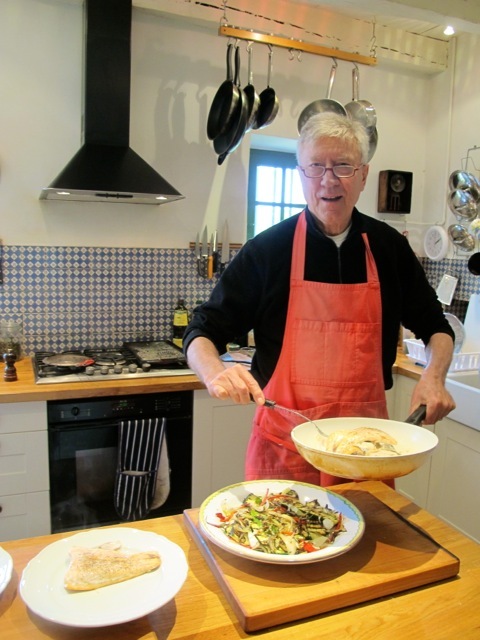 Warm admiring regards for your contributions to cooking for diabetics, as well. My husband is a retired cardiologist and I was a nurse before I decided I wanted to teach languages instead of tending to sick people. I truly admire people who use their talents to help others. Bravo, Robin Ellis! Guess we have that in common – a complete change in careers! Cheers and thanks for your wonderful recipes!! You are such a Mensch!! Thanks Lea–congrats to you too! I never thought about using my griddle for zucchini, but we tried them last night with the onions and chilies and they were delicious! Thanks for such creative recipes! Hello Robin, I had a brainstorm over leftover spaghetti. I just added canned tomato soup and water and made spaghetti soup! It was great. I am diabetic also and like having soups. I have some leftover enchiladas and will try it with them adding some chicken broth and cutting the enchiladas up. Tada! Watch out for the sugar added to the tomato soup!